What made the Arabian originally so sought after? Stamina? Heart? Intelligence? Beauty? Loyalty? We specialize in athletic, beautifully correct Arabians, whom are also phenomenal family pets. At Double Starz we focus on *Bask++,*Naborr, Ferzon and Skowronek blood. Our goal is to bring to you the athlete of your dreams, and we feel these bloodlines are our best way to help you achieve these goals. 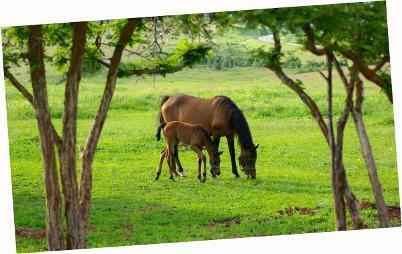 At most breeding farms/ranches, the stallions are the center of their operation. Showing and promoting the stallions, along with collecting the perfect mares to make them shine, are where most of their time, efforts, and money are spent. While we love our stallions and cherish their characteristics and contributions, here at our ranch, the mares are the center of the operation. They are the heart and soul of Double Starz Ranch. We hand picked the stallions to compliment our mares to let them and their foals shine. It took us many years, blood, sweat, and tears to acquire/breed the band of mares that we now have. Nothing less than the perfect stallion for these matriarchs will do. The heart of our Arabian herd, and the center of my heart, is our beloved head mare Rroyalee. Her old Babson dam line and her close sire line to *Bask++ and *Naborr has made her invaluable to us, both as a broodmare, and as my companion. A maternal sister to our lead mare Rroyalee, is the athlete mare Saudii Fadmar. Sharing the same old Babson dam line as her sister, her sire line to Fadjur, *Serafix and *Naborr gives us the cross we want in the ultimate athlete. She carries a close and high content of Skowronek blood as a plus. The daughter of our head mare Rroyalee, is our magnificent Nacacijin DSZ. Her sire's *Naborr and Ferzon blood combined with her dam's *Bask++, *Naborr and Babson blood, was just pure magic. This also gave her a tremendous Skowronek content. Fiesta Thyme PF is our tender hearted and very feminine mare with lines that are an amazing contribution to our herd. Her multi National Champion sire Pyro Thyme SA, Kaiyoum++, Magic VF, *Bask++, *Naborr, *Farazdac, added with the ethereal Spanish beauties *Padre, *Figuroso, Garbo, and Galero make for a top notch dream making broodmare. Also daughter of our head mare Rroyalee, is our filly Rifraffs Royale Rose. She combines the *Bask++, *Naborr, *Dornaba++, and Jewel Drift blood of her dam, the Gainey and high Skowronek content of her sire, and the shared Babson tail female of both, to give us an eye catching athletic producing mare. A daughter of our athlete Saudii Fadmar, is the beautiful powerhouse Sukkars Saudi Sangria. With a heart of gold and an equally impressive mind, what a producer and athlete she will be. Her dam's Fadjur, *Serafix, and *Naborr blood, combined with her sire's *Bask++, *Naborr, *Aladdinn, and Spanish greats Nagasaki and Jaecero, produced an athlete supreme. The filly Rifraffs Russian Nari is just exquisite. She carries the perfect combination of Russian stallions *Muscat,*Nariadni, Arax, and Aswan, and the heavily Skowronek dam line of her dam. Add that with the heavily Gainey and Babson blood of her sire, pure elegance. We are a little ranch located in Clearfield, Utah. We have been raising Arabians for over 20 years. Double Starz Ranch breeds quality 'doing' horses that derive from the reliable old bloodlines of the breathtaking and enchanting Arabian. All of our horses of riding age are put under saddle and evaluated for their trainability, athleticism, stamina, and how sane and solid they are under pressure. Only those that pass our evaluation are used as breeding animals. Every year we have a select few foals that we offer for sale to the discriminating buyer looking for that classical old world style look. Visit our Sales page often for a current sales list of great Double Starz stock as well as our clients offerings. Double Starz Ranch is home to the substantially big bodied, homozygous grey, black based Arabian stallion, Allahs Sukkar Abiad. You just can't get this close to *Bask++ AND *Naborr in ONE pedigree anymore. He is the closest you can get to Kuhailan-Haifi in a sire line anywhere, adding substance and outstanding stamina, with extremely intelligent sane working minds to his foals. 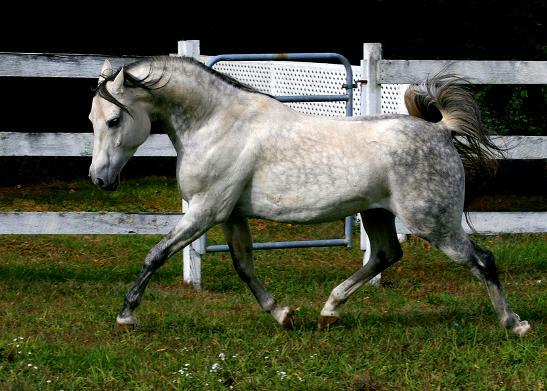 Our junior Arabian stallion is the grey *El Shaklan and *Carmargue bred, Royale Sumernitz. He carries the Ibrahim sire line, only through a different son of Skowronek, Naziri. His tight old Egyptian tail female line helps him to produce superb athletes, adding remarkable substance back into the amazing Arabian breed, along with outstanding dispositions and beauty. We welcome visitors to see our beautiful animals and to understand with your own eyes why these lines are so sought after for both work AND pleasure. All content and images on this website are copyrighted and sole property of the artist.